Wednesday, the North's state media said, amid prospects for a possible state visit by North Korean leader Kim Jong-un to Hanoi this month. 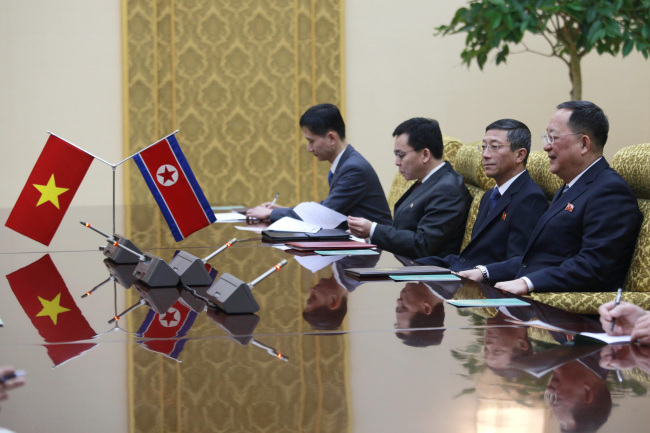 Ri, vice chairman of the Central Committee of the ruling Workers' Party of Korea, met a Vietnamese delegation led by top diplomat Pham Binh Minh in Pyongyang, according to the Korean Central News Agency. Vietnam's foreign minister arrived in North Korea on Tuesday for a three-day visit for talks on a possible state visit by Kim Jong-un to the Southeast Asian country ahead of his second summit with US President Donald Trump. Trump and Kim plan to hold the summit in Hanoi from Feb. 27-28. It will follow their historic first meeting in Singapore last June.